For “The Smart Enough City,” released Tuesday by MIT Press, Green, a Ph.D. candidate at Harvard, spent two years examining the most common mistakes cities make as they attempt to maximize civic technologies across transportation, recreation, public safety and democratic engagement. 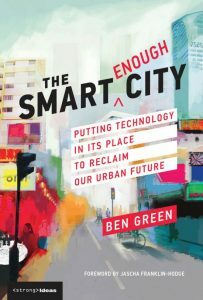 By framing technology as inherently political in nature, Green’s mission is to remove the “tech goggles” — the mindset that individual or combined technologies alone can solve complex political or social problems — from city officials and residents interested in improving urban spaces. “Smart cities” — typically defined as urban governments that use technologies like internet-connected devices and data analysis to optimize civic services and back-office operations —have become increasingly common in recent years. But there’s no agreed-upon definition of what those technologies must be to qualify for the label. Some cities crown themselves as “smart” simply after replacing sodium-based streetlights with LED bulbs, while others construct massive data-analytics platforms to monitor what’s happening in their communities. But too often, Green argues, cities rush into adopting these so-called “smart” upgrades without considering the political ramifications. Data analytics, new streetlights, environmental sensors and surveillance cameras are billed as apolitical because they are viewed as scientific and therefore objective. Yet these technologies can be — and often are — taken captive by the partisan purposes of those who operate or fund them. Applying technology without regard for its political context can “bolster the status quo and obstruct more systemic reforms,” he writes. Green’s primary concern is deterring governments from substituting new technologies for the broader agendas he says are required to solve social and political problems. Applying technologies to problems like public safety, voter turnout or traffic without prioritizing the political motivations that drive their use, he argues, is an easy out for city leaders to ignore difficult social issues that have persisted in urban areas for decades, such as wealth disparities, housing discrimination or unequal access to critical services. Green makes this case most stridently with PredPol, a popular predictive-policing software used by law-enforcement agencies around the country. The program — developed out of research the U.S. military used to track insurgents and forecast casualties during the Iraq War — uses machine-learning to guess where crimes will happen before they occur. The result is that departments often send more officers into low-income areas that the software says are more prone to street crime. “We need to focus on more than just how the technology gets used by the end-user because so much of the application of technology is already determined by the time it’s been developed,” Green said. Green says allocating more police to high-crime areas is the default outcome for cities that use PredPol because of how the software was originally imagined, but there are alternative use-cases that illustrate what a city can do if it has different guiding policies articulated before buying a new product. Johnson County, Kansas, for example, uses predictive policing analysis to figure out where to boost social services. “If cities truly know where crime will occur, why not work with that community and with potential victims to improve those neighborhoods with social services? Why is the only response to send in police to observe the crime and punish the offenders?” Green writes. He also identifies areas beyond law enforcement where applications of smart-city technologies can stray from a city’s intended outcomes. New York City’s LinkNYC kiosks, for example, offer a public good in the form of free Wi-Fi and other digital services, but the trade-off is that through a public-private partnership between the city and its vendor, CityBridge, users are turning over their personal information to government and corporate entities. Most New York residents and tourists don’t have to connect their cellphones to the kiosks, but for a low-income person who can’t afford a data plan on their phone, the free kiosks may be the only way to get online. “Although data collection touches everyone, the most severe impacts of diminishing privacy are suffered by the poor and minorities,” Green writes. Green described the kiosks and other internet-connected devices dotting the outdoor urban landscape as an unavoidable surveillance network. “There are other partnerships that don’t even have that trade-off or service for citizens simply embedded in streetlights or garbage cans and pervasively collecting data about people,” Green said. Green does not say all smart-city programs are inherently Orwellian. He highlights Columbus, Ohio, as a model for how governments can put policy before technology. Columbus, which won a $40 million smart city mobility grant from the U.S. Transportation Department in 2016, is using its funding to deploy a network of driverless shuttles and connected buses throughout its lowest-income neighborhoods. Inequality in access to transportation, Green said, is an issue the city targeted before receiving the grant. “Beyond improving mobility and transit generally, Columbus’s efforts embody a vision to mitigate inequality and improve social welfare,” he writes. The book concludes with several other suggestions for cities seeking to be “smart enough,” such as ensuring that technologies promote democratic values and developing processes for municipal data use. His “incomplete” list of principles, Green says, can help cities build agendas to create more “livable, democratic, just, responsible and innovative” cities.